MCA are pleased to announce the NSW Department of Trade and Industry Registration of their 1200 Class Winders and 24m Head Frame products under MDG33 and MDG2005. In a project spanning 8 months, MCA successfully designed and developed a total equipment system, including fabrication, hydraulic and SIL 2 electrical control. Reviewed both mechanically and electrically by independent industry experts, the entire system has been assessed and approved by the NSW DTI, including 24m Temporary Headframe, 1200 Class Winders, Conveyancers, Type A Rope Attachments and SIL 2 Electrical Control System. 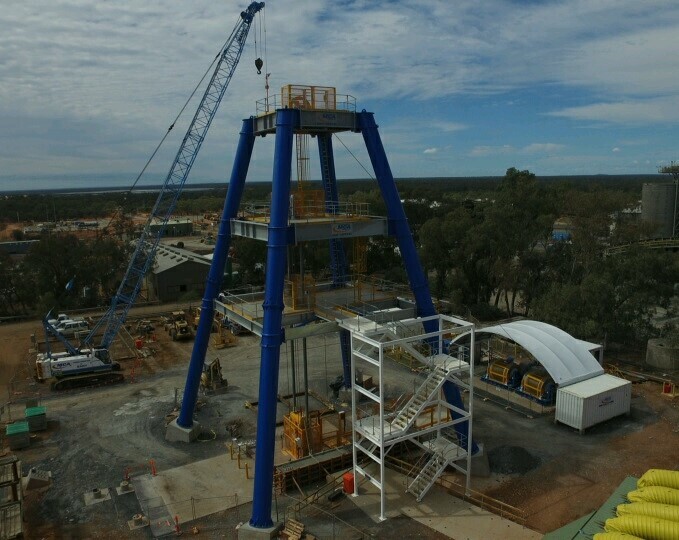 This system has been designed to NSW Guidelines for Mine Winding Systems, MDG33 and MDG2005, as well as relevant Australian Standards. Designed and manufactured in our Thornton and Parkes workshops, this registration sets a new benchmark for construction winders in the industry. “This outcome further underpins MCA shaft capability for both refurbishment and shaft sinking equipment,” said Paul Barwick, Director of MCA Engineering. “We are excited about the opportunities this presents the NSW Mining Industry, and would like to thank everyone involved”. Do you need a customised solution?